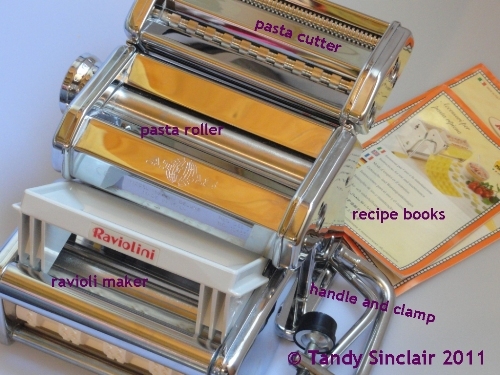 I have a very well loved pasta maker that I would like to sell. It is the Atlas 150 model. The body of the machine is entirely made of Nickel-Plated and Chrome-Plated Steel for long-term resistance to corrosion. The rollers include an opening for the handle (included) and motor (not included) to fit. The included handle and clamp have hand grips made of ABS suitable for food use. Included are two recipe books with detailed instructions in various languages and basic recipes. Roll out perfect pasta dough to the exact width and thickness you prefer with the Atlas Pasta Maker. It comes with a cutter for angel hair pasta and taglietelle as well as a ravioli maker. The total value of this is R1426 – excluding P&P. If you would like to purchase this from me, please let me know. I want R1000 for the entire lot. This has been sold! It has found a loving home and is used often which makes my heart smile. If you are looking for a pasta maker for your home I wold recommend this one without a doubt. I have this same brand for a pasta maker and it’s a superb performer! I always recommend this pasta maker brand to friends who are planning to buy a new one. The Atlas 150 is a super solid machine! It’s what I’m planning to buy new. Good luck with the sale. It look really nice. can you imagine the postal costs? Sorry Tandy, I already have one/. Hope you get it sold soon.